In this post I am going to tell how to use Followfast to get unlimited Facebook (Like, Comment and Share), Twitter (Follow, Tweet, Likes, Retweet), YouTube (Viewers, Likes, Subscribers), instagram (Follow, Photo), SoundCloud (Follow, Likes), Reddit Views, Stumble Followers, Linkedin Shares, Websites Traffic and also it can Improve Alexa rank of your website. Have a look Top Huge Facebook Group list to Join big community to get Like/Comment/Share. And also read, How to check who not accepted your friend request. Almost Every one is using Facebook, Twitter and Google Plus like Social media. According to Wikipedia Facebook have 1.65 billion monthly active users and Twitter has 313 million monthly active users. So you Can Understand How much we are socially. If you are one of them who is using these social networking site then this post is for you. Have a look another site as compared to Followfast, is Addmefast . If you want to get many likes, comment, Share, tweet, Follower then It will help you in getting these things for Free. After Joining FollowFast Follow below process to Get Likes/Comment/Tweet. FollowFast Tricks, How it Works. FollowFast gives 50 Points for new registration. Points are use to get Likes/Follows So You have to collect points by doing simple task to get continuous Social Likes. Do Like/Comment/Other Task for Others = Get Like/Comment/and…. Means. Like someone Page/Photo/Post or any other task and get Points. And then use this points in Getting Likes. Do participate in Rally Contest and get Chance to win 600, 300, 150, 130 Points. Actually FollowFast Play Daily Contest and they pay 1165 Points for Top 5 Likers Everday. If you are committed to Participate in Rally then you should take benefits of this. You can increase your Rally Rank Every 30 minutes by Clicking Link and it will increase your rank +6 Free Hits..! Refer and Earn is very best way to boost your points. If you have not Joined then Join and take benefits of Refer Section. 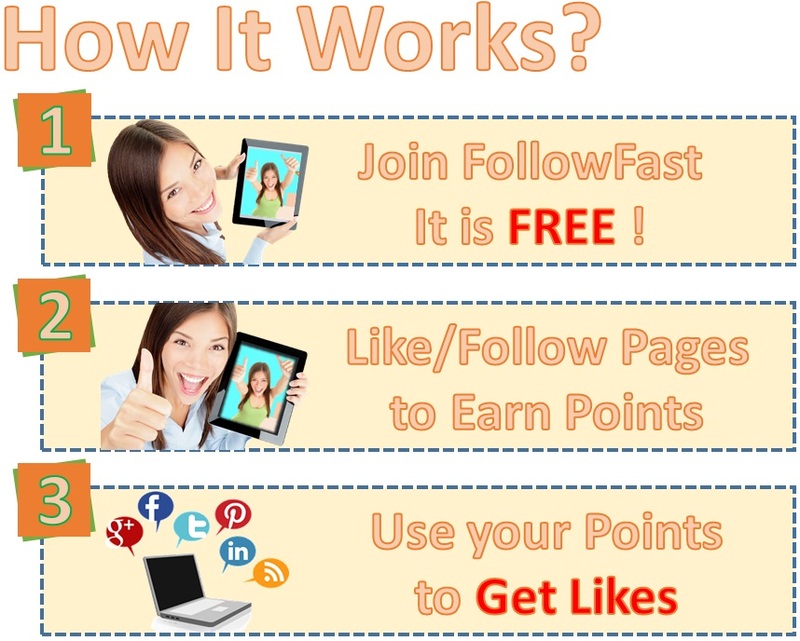 When someone Join FollowFast.com through your Referral link, you will earn 10% of All Referrals and also You will get 10% of your referrals collected points. Not only this, You will get 100 Points for Eact Active Referral. (10 Points fof joining, 100 Points for their 100 hits). Note: If You join through above given links we will earn referral commission. There is not only Followfast for social shares. you can also join other best website for Unlimited followers, likes and subscribes. I have used this tools many times and safe to use. Finally Let us know if you have any question related to this tutorial and also tell us how many points you got.? Thanks for useful information. I got many likes on my profile page. I am also using Facebook Auto Liker for facebook likes. It’s also awesome.